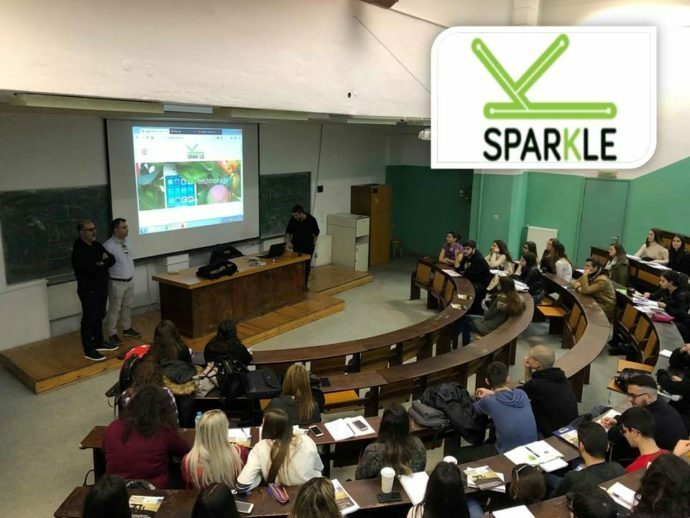 On December 10th, 2018, the first national dissemination conference has been organized by the Greek participating partners, in SPARKE project, in the Aristotle University of Thessaloniki. For the purpose of this event faculty staff members and students of the School of Agriculture as well as Greek farmers have been invited to participate. As a result more than 200 participants were participated in the large amphitheater of the School of Agriculture. During the national dissemination day in Thessaloniki four presentations were took place: Firstly, the general objectives of the project as well as the structure of the work plan, the work packages and the main deliverables have been presented by Prof. Michailidis Anastasios. Following, Prof. Bournaris Thomas presented the SPARKLE website and the social network opportunities while Prof. Partalidou Maria presented the results of the Business Model Canvas interviews. Finally Paltaki Aikaterini presented the results of the students’ survey regarding their training needs in precision agriculture. Public was encouraged to participate with comments, questions or ideas and to interact via social networks. It’s worth-noting that student were very interested on the results of the surveys and especially on the differences in training needs and technical skills among Euro-Mediterranean countries. It was a very interesting and useful opportunity to disseminate the work done in SPARKLE project so far and to deeply discuss issues related to training needs and training with farmers, students and researches in Greece. Some important concluding remarks and policy implications have been derived during this event which will be communicated with the SPARKLE consortium. Conscious wine: our land, innovation and technology in a bottle.